My name is Jim Townsend. As of December of 2009 I have completed three years of work as an Over-The-Road (OTR) truck driver. This web site is the continuation of two blogs I have written over the past 2.5 years: OTRjournal and LeasePurchaseJournal. The complete content of both of those blogs have been imported to this site, a total of nearly 1,000 posts. From December 1, 2006 through February 29, 2008 I drove approximately 160,000 miles for CFI, which is now Con-Way Truckload. I left on good terms to pursue the next step in my trucking career, which was to become a lease-purchase operator. 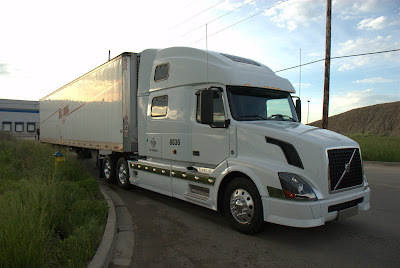 Since March of 2008 I have driven both as a company driver for Hill Bros out of Omaha, Nebraska and also as a lease-purchase operator for them, having recently completed the 18th month of my lease. Each quarter I publish my financial results here (links can be found on the Mileposts page). At the end of my first full year in my lease I published a Google spreadsheet with information from all of my settlements, including details on every load I picked up and delivered during that year. You can find this document and future ones on the Financials page. My goal for this site is to educate newer drivers and those researching the industry on what it is really like to work as an OTR truck driver. I also want to show through example that it is possible to make a good living by working smarter, not necessarily harder, and to detail this week-by-week and load-by-load in the form of quarterly and yearly reviews of my financial results. Mine is a 2007 model with the 2006 Volvo D12 engine and a 13-speed manual transmission.